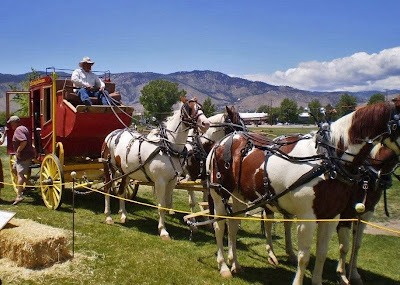 It was a very pleasant day in Carson City for the Rendezvous festival. There was a slight cloud cover and a tiny breeze to bring the thermometer to the low 70's. This was great weather to fire up the cast iron vessels for a cook off. The theme of the Rendezvous, was life in the 1800's. There were a lot of people in costume. Civil War reenactors staged a mock fight. Those cannons sure were loud. I am not sure who won. Music, food and lots of crafts rounded out this event. 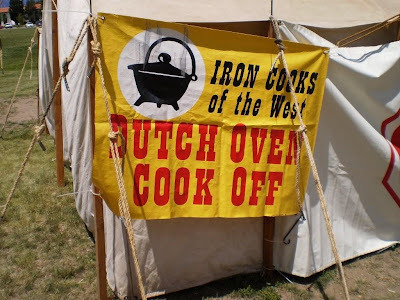 We were there for the Dutch Oven Cook off. worth everything. This is what we compete for. It was reported later that the 'Space Shuttle Endeavour' saw the grin on my face!!!!!!!!!!! Here is the recipe for the "PEOPLE'S CHOICE" winner. It is a sweet savory cornbread. I used home smoked bacon. Whisk both flours, cornmeal, sugar, salt and baking powder in large bowl. Whisk buttermilk, melted butter, maple syrup, eggs and extract in medium bowl. Add buttermilk mixture to flour mixture, stir until blended. Stir in 3/4 cup chopped pecans and cranberries. Spoon butter into pan. Arrange pecan halves in row down center of batter. Bake at 400 degrees for 40 minutes or until Golden brown and knife inserted comes out clean. After the festival, Ms. Goofy and I managed to have a couple of Meat Adventures. We picked up some chorizo from a wonderful Basque restaurant. (Villa Basque Deli & Cafe). 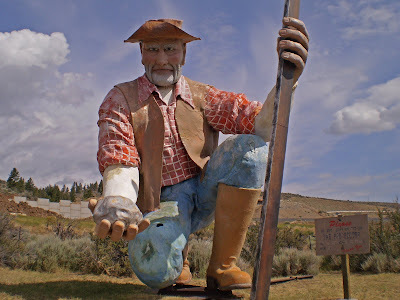 Two new bacon's were discovered at "Butcher Boy" in Reno. Several local Hot Sauces were found. Our adventure ended at Harrah's Steak House for a gastronomical extravaganza dinner. It was a great weekend. Once Ms. Goofy unloads the car and puts everything away we can start to sample our bounty! Holy s**t, is that really hair on the lampshade, or really stringy dust? The rest of your adventure sounds great but that lampshade - ugh. Shades of Hitler and his human skin lampshade. Eeek. Wow Zoomie, Hitler shades are a little extreme, and I know Harrah's did not have that in mind. I think they are more on the lines of 1960's 'Shagalicious'. We got a big kick with them. It reminded me of my bachelor days. It was a combination of stringy dust and groovy baby!! !